Its a instrument built to measure the intensities of the heavy nuclear species in the cosmic rays up to energies of 10 Tev/nucleon. It measures the nuclear charge, the energy, and the trajectory of the incoming particles through the instrument. The innovative aproach of TRACER is to replace the traditional Multi Wire Proportional Chambers of other detectors by layers of thin-walled single proportional tubes which can easily withstand internal overpressure. This avoid the need of using a heavy pressurized container, saving weight and thus allowing the construction of a larger area detector. The instrument derives its heritage from the CRN detector developed at the University of Chicago for space flight in the decade of the 80's. TRACER consists of eight double layers of proportional tubes 2 m long with a diameter of 2 cm made of aluminized mylar, filled with a mixture of xenon and methane. These are mounted in 16 sub assemblies ("manifolds"), each containing a double layer of 99 tubes oriented alternately in two orthogonal directions. This configuration forms an 2 x 2 square meters array of proportional tubes with 16 layers and 1584 proportional tubes in total allowing to determine the particle trajectory and at the same time to correct the data pathlength variations. Printed circuit boards inside the manifolds provide high voltage for the proportional tubes and allow a capacitive read-out of the signal wires. Eight layers of tubes serve to measure ionization losses of high energy particles. 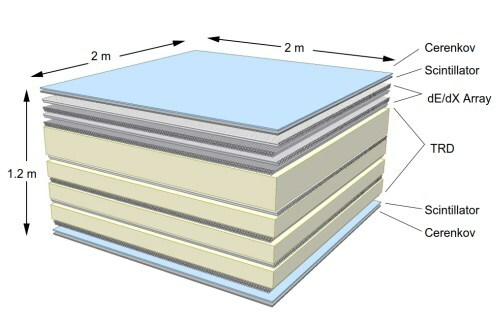 The next eight layers, installed below blankets of plastic fiber material acts as a radiator to generate transition radiation. The wire signals of the proportional tubes are read with a low power AMPLEX integrated circuit. The preamplifiers are installed inside aluminum housings directly at the manifolds in order to reduce electronic noise. Two scintillators are placed on top and bottom of the detector stack, respectively acting as instrument trigger, and measuring the specific ionization, to determine the particle's charge. Additionally a Cherenkov counter made of acrylic plastic at the bottom of the detector is used to reject non-relativistic particles. The plastic scintillators are 1 cm thick, and are read out via wavelength shifter bars with 12 photomultiplier tubes while the Cerenkov signals are measured by 24 photo multiplier tubes. Heart of the TRACER electronics is an Intel 486 CPU inside a VME-crate. 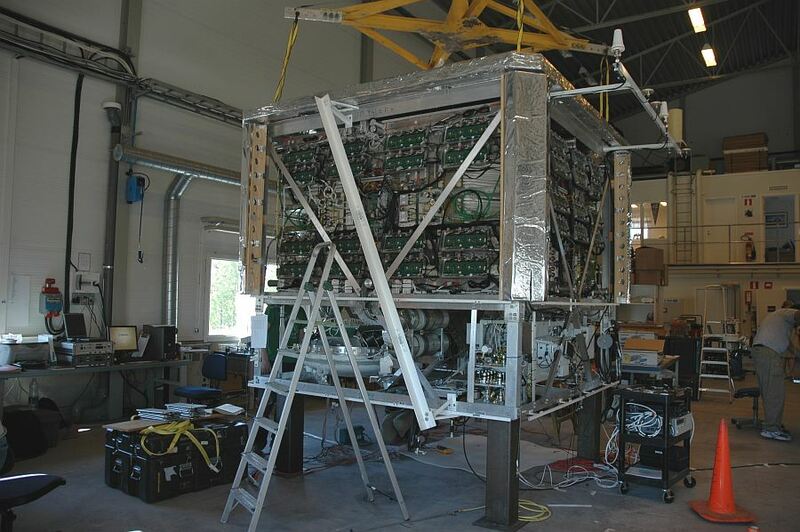 The crate is installed together with the hard drives for flight data recording, a main electronics crate as well as the high voltage supplies for the proportional tubes and the photomultiplier tubes inside a pressurized sphere. All other electronic components like the valves for the gas system and the main amplifiers and analog to digital converters for the proportional tubes and the photomultiplier tubes are mounted on the instrument frame without a pressurized shell. The whole detector is mounted inside a 2.5 x 2.5 x 3 square meters aluminum structure without a surrounding pressurized shell. The outer skin of the instrument is a 10 cm foam layer covered with aluminized mylar acting as thermal insulation. 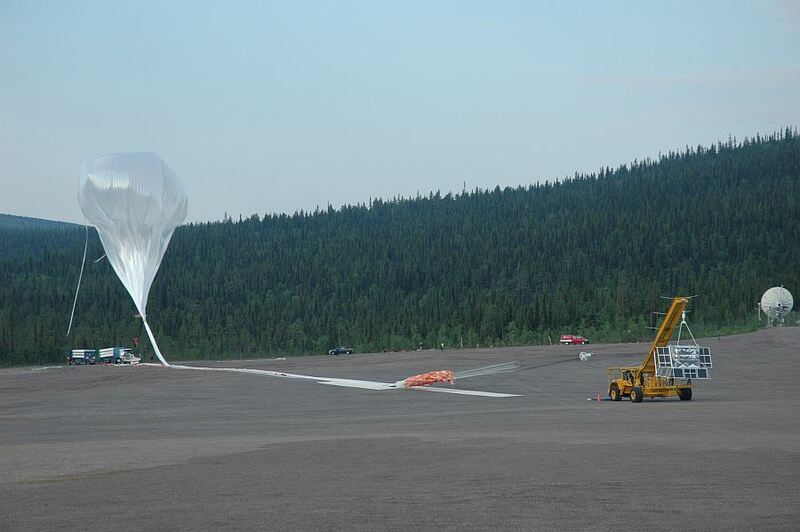 The balloon was launched after various delays by bad weather on July 8th at 3:42 utc, by dynamic method using a launch vehicle called Hercules. After a nominal ascent phase the float altitude of 127.800 ft was achieved. Then the balloon started a slow west drift over the Atlantic Ocean towards Northamerica. 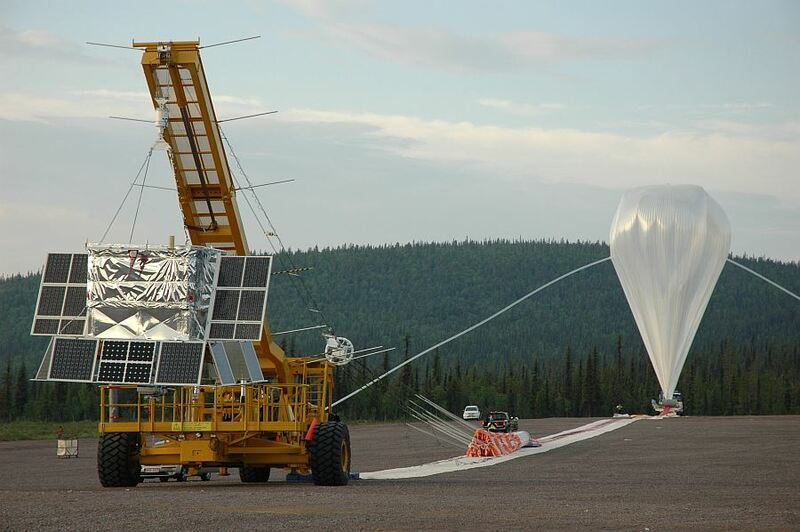 Althought the flight was scheduled to fly for 5-6 day, at the fourth day of travel was decided to end the flight when flying over Northern Canada because the balloon experienced a northward route with chances of a descent over the Arctic Ocean and a rather complicated recovery operation. To avoid this the cutdown command was sent by satellite from the CSBF's Operations Center in Palestine, Texas, at 17:00 utc on July 12th. The gondola impacted ground 40 minutes later on Somerset Island, 75 nm south southeast of Resolute, Nunavut Province, Canada. The chase aircraft reported the payload landed in an upright position and appeared to be in excellent condition. This was the second scientific flight of the instrument. After recovery from the Antarctic flight on 2003, TRACER was refurbished and upgraded. The number of photomultipliers on the bottom scintillation counter was doubled and also was added a second plastic Cerenkov counter that was placed on top of the instrument. For this mission, also was modified the trigger threshold. It was set at a signal level corresponding to a nuclear charge between lithium and beryllium allowing for full efficiency for the lighter elements boron, carbon, and nitrogen in addition to the heavier elements. 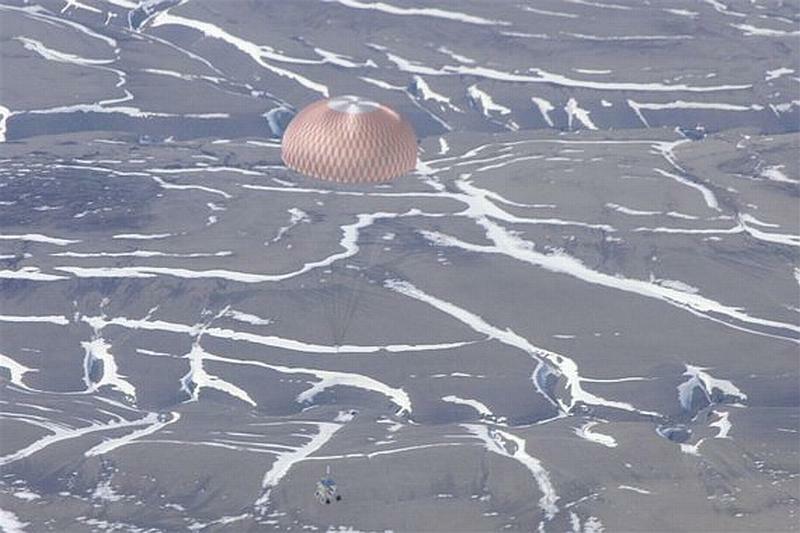 The initial intent was launch the balloon from Sweden and let it circumnavigate the North Pole and travel over Russia and land in Sweden or in northern Canada. Unfortunately, Russian overflight permission was not granted for this flight, and hence the flight had to be terminated after four and a half days in northern Canada. The instrument was successfully recovered and the onboard data disks were removed. A total of 30 millions of cosmic ray events were collected.